Being a person who is up in years with less years ahead of me than behind me, there are some things I should have learned by now. My husband and I pride ourselves in having more education than we need at this point and most often we use pretty good sense. This week I feel we made a giant step backward. It all started with putting up the dreaded Christmas Tree. Several years ago we bought an 8 foot pre-lit tree. It came in three sections, and the lights were already on the tree. It came in a large box which was a bit of a struggle but we managed. The first year it was awesome. We opened the box, put the sections together and plugged it in. Walla, all it needed was ornaments. After Christmas the struggle began. We couldn't for the life of us get all the sections back into the box. We ended up putting one of the sections in another box. Next was where to store the darn thing. We do have a storage area in our lower level so we made room, wrestled it down there and forgot about it until the next year. 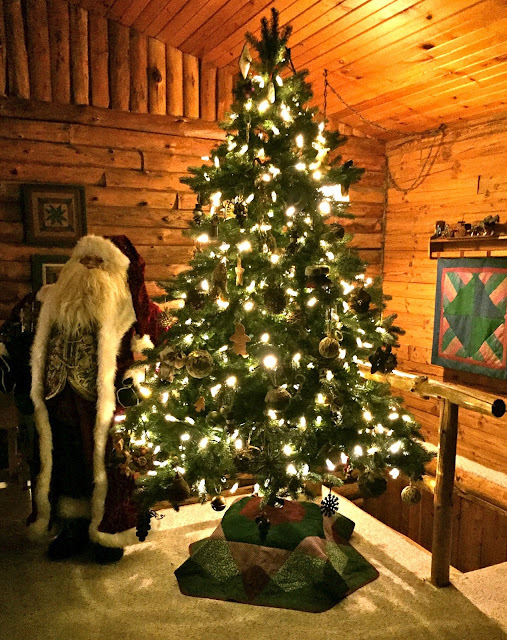 Then every Christmas season for a few years we maneuvered it from the storage room, past the junk in the way, past the freezer, through the laundry room, down the hall and up the stairs. It was worth it because it went together so easy. Then last year all the lights didn't want to light up. We bought a tester which didn't work. We changed out light bulbs and fuses and managed to get them to light. This year when it was time for the tree again, I was nervous. I had reason to be nervous. The tree didn't light in a lot of places. I did replace a few fuses, but that didn't work. Next was the decision to throw out the tree and buy another pre-lit tree but smaller, to mess around with the light bulbs and fuses again or cut the lights out and buy strings of LED lights. 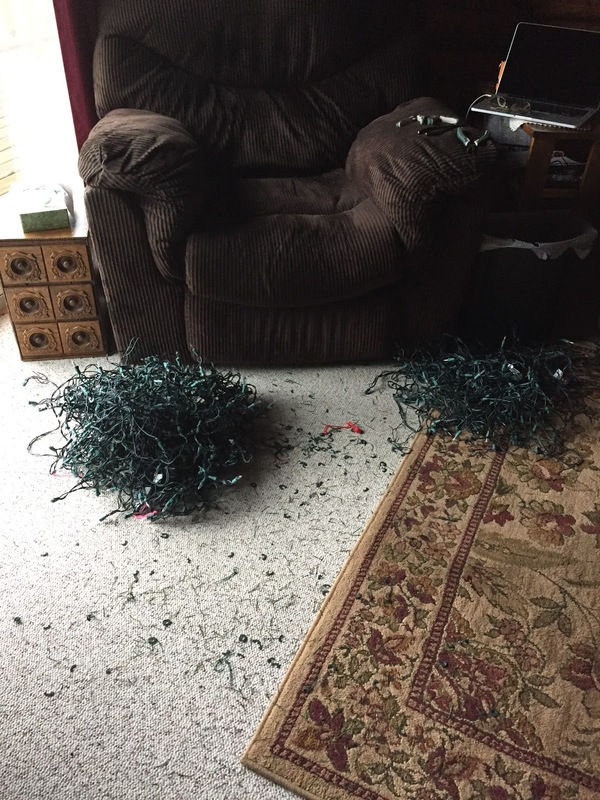 Being somewhat cheap and not knowing how to get rid of the old tree, we opted for cutting out the 1000 mini lights. How hard could that be? This is where our logic and good sense is questioned. It was a miserable job which took five or more hours. I have little scratches all over my hands and a big mess on the floor. 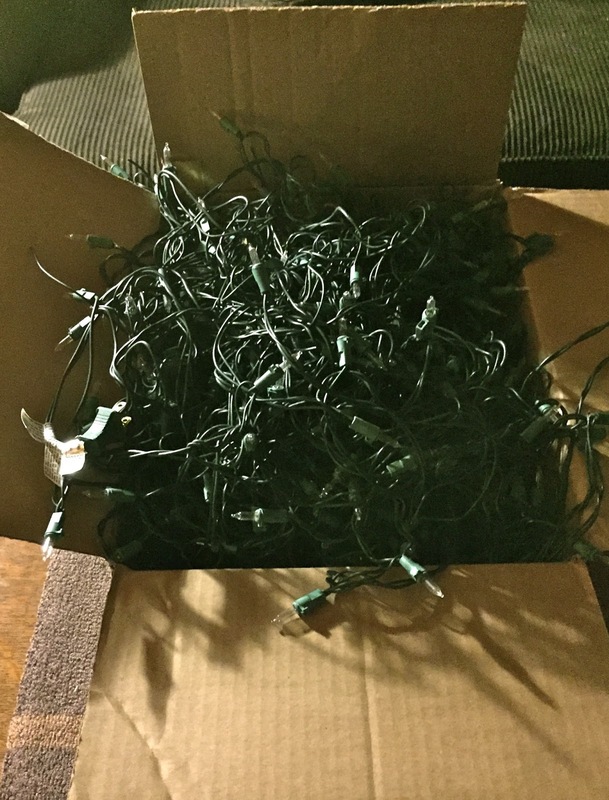 It's hard to believe the old lights all fit in this box. When all the lights were removed, we put the tree together. I imagine we are throwing away 999 good light bulbs, but finding the one or two bad ones was more than we could muster. We were able to find a very good price on LED lights so we bought four strings of 105 lights. Instead of the mini lights, we bought the C6 size. Now we know why we bought a pre-lit tree in the first place. Putting lights on a Christmas Tree is a pain, but when the ornaments are on it doesn't really matter if they are evenly spaced. After taking a few breaks because my patience was running thin, the job is done. I am not sure I would make that same decision again but at least part of our tree will not be going into the landfill. I kind of like the bigger lights. All that is left is the star and a few more ornaments.